Get ahead in your career with a professional qualification! Enrol now and get 25% off. 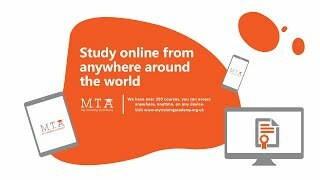 Need Free Course Advice and Guidance? Please provide your details and one of our friendly course advisors will contact you shortly. Yes, I’d like My Training Academy to contact me via email and phone about course-related topics. Please read our privacy notice for more information. Please filll the checkbox. The CompTIA A+ is recognised as one of the top entry-level certifications in the industry. It validates your understanding of the most common hardware and software technologies in business and certifies the skills to support complex IT infrastructures. If you change your mind about your course purchase, you can apply for a refund within 14 days of purchase, provided that you haven't accessed your course material. Please note that you are no longer eligible if you have accessed your course material or communicated with any course tutors. Paying for your course has never been easier! Yes, I’d like My Training Academy to contact me via email and phone about course-related topics. Please read our privacy notice for more information. Please fill the checkbox. CompTIA is a globally recognised provider of top quality IT certifications that help to train and identify knowledgeable IT professionals. According to CompTIA, over a million IT professionals worldwide currently hold the A+ certification. It is the most essential IT certification for anyone looking to build a successful IT career. If you’re new to the IT industry, the CompTIA A+ will help you to kick-start your career. And if you’re already an IT professional, the A+ validates your skills and can boost your career. On this CompTIA A+ online course you’ll learn how to maintain PC’s, mobile devices, operating systems, and printers. The course establishes the best practices in troubleshooting, security and networking across a number of devices. Our comprehensive online CompTIA A+ training course is delivered by expert instructors with practical, real-word experience. Their aim is to provide you with all you need to pass your CompTIA A+ examination. By passing the CompTIA A+ exam, you’ll prove to employers that you have mastered the technologies found in today’s extensive and varied IT environments, and can confidently handle the most challenging technology problems more efficiently. CompTIA A+ acts as a stepping stone towards more advanced qualifications, such as CompTIA Network+ and CompTIA Security+. The CompTIA A+ validates skills employers need from entry-level technicians and often provides entry-level employment opportunities for aspiring IT practitioners without work-related experience. Once certified, you’ll qualify for jobs such as IT support and Technical support specialist, earning up to £25k a year. Adding the CompTIA A+ qualification to your CV will greatly broaden your career prospects and significantly improve your earning potential with current or future employers. There are no prerequisites to study the CompTIA A+ course although the CompTIA IT Fundamentals is available for individuals completely new to the world of technology. This course is ideal for anyone looking to pursue a career in IT, whether you're taking your first steps within the industry or acquiring the certifications required to advance your career. The CompTIA A+ certification is the ideal way to break through into the IT industry. By choosing online learning instead of a classroom based course, it eliminates the need for time away from work, saving you valuable time and money. It is ideal for those with tight schedules as our online courses give you 12 months unlimited access to all the course materials, so you can study at a pace that suits you. Allowing you to easily resume your studies whenever you have the time. All you need is internet connection to study, so you can study from the comfort of your home or any environment that suits you. To earn your official A+ certification from CompTIA, you will need to study the training courses and achieve a passing mark for both compulsory exams. These two exams include the 220-1001 exam which should be completed first before starting the 220-1002 exam. CompTIA A+ 220-1001 - This exam covers mobile devices, networking technology, hardware, virtualization and cloud computing and network troubleshooting. CompTIA A+ 220-1002 - The second exam covers installing and configuring operating systems, expanded security, software troubleshooting and operational procedures. To prepare you for your exam, we provide interactive quizzes after each module and a mock exam at the end of your course to ensure you’re fully prepared for the real thing. Once you’ve passed with at least 85%, you’ll be ready to book your exam as a private candidate. To make life easier, we can help you find an appropriate exam centre and give you all the information you need to secure your place. Once you’re fully prepared and ready to sit your exam, all you’ll have to do is purchase your exam voucher and schedule your exam at a test centre near you. You can use the Pearson Vue Test Locator to find test centre locations near you.For more information on how to schedule your exams, please visit our schedule my exams page. Got a question about exams? Contact our course advisors by email or by phone on 01707 828 751. We're happy to help! For the best viewing experience on our state-of-the-art eLearning platform we recommend an internet connection of 10Mbps or better. Please also use Google Chrome or Mozilla Firefox as your browser with Adobe Flash Player. Why should I become CompTIA A+ certified? We would highly recommend that you become CompTIA A+ certified as it is beneficial to you in many ways. Firstly it can increase your earning potential greatly. It is said that on average an A+ certified delegate can earn £25,000 annually. Having this qualification on your CV can give you a competitive edge over others who may be applying for the same role. According to the CompTIA Employer Perceptions of IT Training and Certification study 91% of managers who are looking to hire staff value an IT certification highly on a perspective candidates CV. Another reason you should undertake this course is that the skills you will be learning and will become certified to perform are universal. Which means you can work with a wide range of hardware. Is the CompTIA A+ certification internationally recognised? Yes. The Computing Technology Industry Association (CompTIA) A+ certification is compliant with ISO standards and has been validated by the United States Department of Defense. No, you will need to book your exam separately through Pearson Vue. To make life easier, we can help you find an appropriate exam centre and give you all the information you need to secure your place. What types of questions can I expect during my exam? The CompTIA A+ exam includes both multiple choice and performance-based questions to fully test the knowledge you have gained from your studies. We offer short professional courses to help you get certified within a reasonable time frame. Each certification course is covered between 20-35 hours. This means if you’re able to schedule 10-15 hours’ worth of studies a week, you’ll be able to complete a course within a month. We only use the industry’s finest instructors to develop our courses. They have a minimum of 15 years real-world experience and are subject matter experts in their fields. How many questions will there be on the CompTIA A+ exam? This exam (in both parts) will include a maximum of 90 questions. What is the pass mark for these exams? The CompTIA 220-1001 exam requires a score of 675 on a scale of 900 and the CompTIA 220-1002 exam requires a score of 700 on a scale of 900. You will instantly receive a confirmation email with your order details and your course login details will follow within one business working day. If we haven't answered your questions, please submit a question. We are happy to help and answer any questions you might have. GET CERTIFIED WITH MTA TODAY! It’s simple, it’s flexible and affordable. In these roles, the average salary you can earn is £24,000.00 per year (source: itjobswatch.co.uk, UK Only). IT Jobs Watch provides a unique perspective on today's information technology job market. Their aim is to present a concise and accurate map of the prevailing UK IT job market conditions. How to put together a killer CV, Covering Letters and Thank You emails. How to gain relevant work experience. How to prepare for interviews. How to understand Job adverts. How to choose the right recruitment agency. How to look for work on LinkedIn. Information on dealing with redundancy. Our careers advice section is available for you to see now. For more information about our career advice services, contact us on 01707 828 8751 to speak with one of our friendly course advisors today. Professional certification is critical for any IT technician who wants to establish a long and successful career. By earning CompTIA A+ certification, you will demonstrate your competency as an entry-level computer technician, which can open the door to a wide range of exciting career possibilities. Many employers consider the CompTIA A+ certification as a prerequisite when considering applicants for positions such as IT Technicians or Technical Support Staff. It is trusted as a solid starting point in the IT field and will be a great addition to your CV. Getting a CompTIA certification will always help you stand out from the crowd, now and in the future - whether you're just starting out, developing your career, or changing direction entirely. We only use the industry’s finest instructors to develop our courses. They have a minimum of 15 years real-world experience and are subject matter experts in their fields. Unlike a live class, you can fast-forward, repeat or rewind all your lectures. This creates a personal learning experience and gives you all the benefit of hands-on training with the flexibility of doing it around your schedule 24/7. As a bolt-on option, we offer Practice Labs as it provides users with an online lab platform to develop their practical skills in IT technologies such as CompTIA, Microsoft, Cisco and VMWare. In addition to the hardware you require, you also gain access to high quality practical exercises covering exam topics to help you to maximize your study time and increase your results. Practice Labs are highly effective and offer a cheaper alternative to setting up your own test environment. You will gain unlimited access to the Practice Labs for 12 months- helping you to consolidate your learning and prepare you for work. This bolt-on option will provide you with a wealth of research and reference material to help you make the most of your studies. Our e-book's library will serve as a great addition to your course material and provide massive savings in comparison to the cost of buying additional study books to support your learning. For more information about our career advice services, contact us on 01707 828 8751 to speak with one of our friendly course advisors today. The Microsoft 70-243: Administering and Deploying SCCM 201 is excellent, very concise and easy to follow, i have recommended it to a few of my colleges already. I would like to say that the PRINCE2 project management course was well presented and easy to follow. The level of service and the help from staff was excellent and I thank you. I would recommend anyone wishing to study, to do it with My Training Academy. The Sage course is interesting, informative and easy to understand.